No aesthetic surgeon is equally well-versed in every procedure and every surgical technique. Nevertheless specializations in a field as broad as medicine are important and sensible. Hence there are experts in liposuction and body contouring, in breast operations, nose jobs, eyelid and scar correction, etc. The following national and international specialists will advise and treat you in the Clinic DDr. Heinrich®, in order to ensure that you receive the best possible care for your particular problem from the right person. Furthermore, in certain individual cases we will also consult with other doctors, or we will gladly refer you to expert colleagues for procedures and treatments outside our specialty fields. DDr. Heinrich is a board-certified general practitioner* who works in the areas of therapeutically indicated aesthetic surgery and regenerative medicine. Anti-aging medicine and aesthetic endocrinology are amongst the types of treatment he focuses on. DDr. Heinrich holds patents for inventions in medicine such as special microcannulas for liposuction. His scientific work as well as his longstanding focus on body fat and its therapeutic potential enabled him to participate in new therapeutic developments and improvements. Dr. Emellina is a general practitioner and an ophthalmologist. 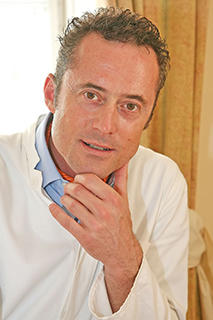 He is one of our consultant physicians, but performs medical treatments only in his clinics in Italy and France. His specialties include facial surgery and scar correction.